IAC posts updated 6-page handout for the public titled "Influenza: Questions and Answers"
In an October 5 news release, the U.S. Food and Drug Administration (FDA) announced it has approved the expanded use of Gardasil 9 (human papillomavirus [HPV] 9-valent recombinant vaccine; Merck) for individuals ages 27 through 45 years of age. Gardasil 9 prevents certain cancers and diseases caused by the nine HPV types covered by the vaccine. A statement by Peter Marks, MD, PhD, director of the FDA's Center for Biologics Evaluation and Research, included in the news release, is reprinted below. Today’s approval represents an important opportunity to help prevent HPV-related diseases and cancers in a broader age range. The Centers for Disease Control and Prevention has stated that HPV vaccination prior to becoming infected with the HPV types covered by the vaccine has the potential to prevent more than 90 percent of these cancers, or 31,200 cases every year, from ever developing. View the complete October 5 press release on the FDA website: FDA approves expanded use of Gardasil 9 to include individuals 27 through 45 years old. IAC's Ask the Experts: Administering Vaccines and Ask the Experts: Storage and Handling web pages have been completely reviewed and updated by experts at CDC. Ask the Experts: Administering Vaccines: Revisions were made to reorganize the web page, to update several website links and references, and to delete outdated information. Revisions were also made to disease burden. Ask the Experts: Storage and Handling: Revisions include updates of website links, removal of references to obsolete products, and change in display of temperature ranges to be consistent with CDC standard (listing Celsius first with Fahrenheit values in parentheses). There are no new recommendations. IAC's Standing Orders Templates for Administering Vaccines web page on immunize.org contains standing order templates and related resources for vaccines recommended for children, teens, and adults. Use the templates "as is" or modify them to suit your healthcare setting's needs. Using standing order templates can help you improve vaccination rates. Standing orders authorize nurses, pharmacists, and other appropriately trained healthcare personnel, where allowed by state law, to assess a patient’s immunization status and administer vaccinations according to a protocol approved by a physician, medical director, or other authorized practitioner. Standing orders work by enabling assessment and vaccination of the patient without the need for clinician examination or direct order from the attending provider at the time of the interaction. IAC has developed 31 standing orders templates for vaccines that are routinely recommended for children and adults. They are updated as needed and reviewed for technical accuracy by immunization experts at CDC. The most current versions can be accessed by going to www.immunize.org/standing-orders. Visit the Standing Orders Templates for Administering Vaccines web page on immunize.org to access these valuable templates and resources. CDC has posted its 2018–19 Digital Campaign Toolkit with seasonal flu vaccination campaign materials to assist partners in communicating about the importance of vaccination. This digital toolkit includes a listing of events and activities, sample social media and newsletter content, graphics, web resources, web assets, and media preparation material. This material is downloadable and shareable, and some of the material is customizable. The full campaign toolkit can be viewed and downloaded in Spanish by choosing "Spanish" in the language bar in the top right corner of the page. Visit CDC's 2018–19 Digital Campaign Toolkit web section to access the full range of resources it offers. The National Meningitis Association (NMA), in collaboration with Sanofi Pasteur, recently announced the launch of "The 16 Vaccine" educational awareness campaign website. "The 16 Vaccine" website (https://the16vaccine.org) includes three brief, moving video stories—two told by meningitis survivors—a high school senior and a college junior—and another told by the sister of a teen-age girl who died from the disease. "The 16 Vaccine" website also offers social media resources that can be shared with personal and professional networks to educate parents about the dangers of bacterial meningitis. 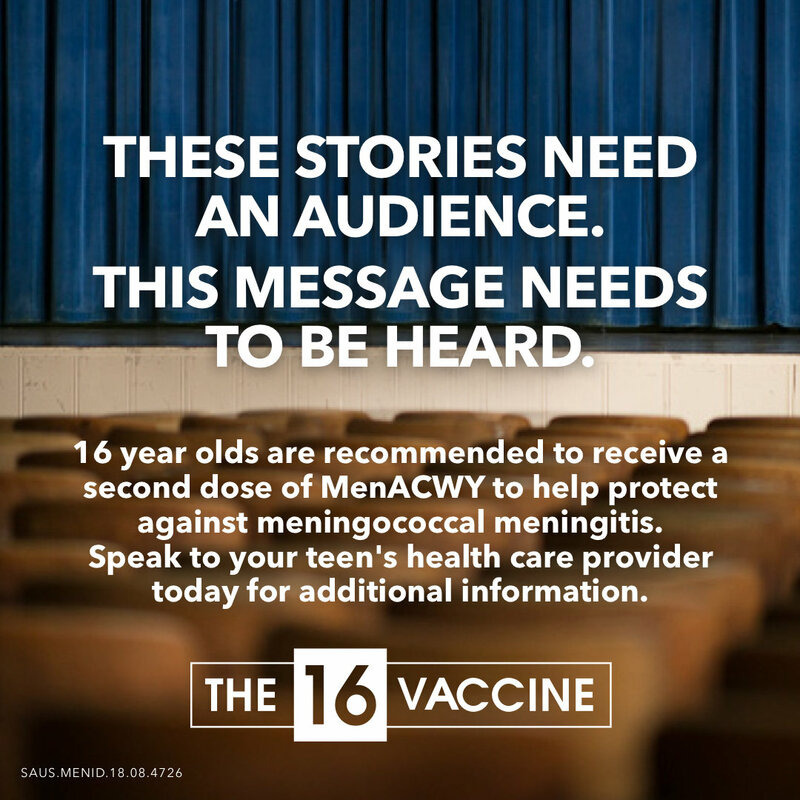 This campaign advocates for CDC’s recommended second dose of MenACWY vaccine at age 16, when teens are most at risk for meningococcal meningitis. NMA also urges parents to discuss with their teen's doctor about all vaccinations they should consider for their teen. IAC recently revised its resource for healthcare professionals titled How to Administer Intramuscular and Intranasal Influenza Vaccines. The instructions for administering the intradermal administration of influenza vaccine were removed because Fluzone ID (Sanofi) is no longer available. IAC recently revised its 6-page handout for the public titled Influenza: Questions and Answers. Changes were made to update morbidity and mortality information for influenza, to separate out the recombinant influenza vaccine from other inactivated vaccines, to clarify the recommendation for the number of doses to give to children ages 6 months through 8 years for their primary vaccination, to expand and name the three brands of vaccine that can be given to infants beginning at age 6 months, and to include live attenuated influenza vaccine among the recommended vaccine products that can be given for the 2018–19 season. IAC recently posted updated Spanish translations of the VISs for DTaP (diphtheria, tetanus, pertussis) and meningococcal ACWY vaccines. As reported in IAC Express on August 29, the English-language versions were updated on August 24, 2018. IAC also posted the Spanish version of the DTaP and MenACWY VISs in rich text format (RTF). RTF files are intended for use in electronic systems, such as electronic medical records, immunization information systems, or other electronic databases. CDC supplies RTF files of the English-language VISs, and IAC provides Spanish RTF files of VISs for each routinely recommended vaccine. The World Health Organization (WHO) is supporting Zimbabwe's effort to vaccinate 1.4 million people against cholera in the current outbreak by providing medical supplies and assistance with the rollout strategy. The outbreak, which began in the capital of Harare in early September, has led to over 8,535 suspected cases and 50 deaths, and it has spread to five additional districts. CDC recently released the September issue of its monthly newsletter Immunization Works. The newsletter offers the immunization community information about current topics. The information is in the public domain and can be reproduced and circulated widely. A study published by The Lancet Public Health projects elimination of cervical cancer in Australia within two decades because of the government program to vaccinate children against HPV. This study, The projected timeframe until cervical cancer elimination in Australia: a modelling study, by M.T. Hall, et al, was published on October 2. The Background section of the Summary is reprinted below. In 2007, Australia was one of the first countries to introduce a national human papillomavirus (HPV) vaccination programme, and it has since achieved high vaccination coverage across both sexes. In December, 2017, organised cervical screening in Australia transitioned from cytology-based screening every 2 years for women aged from 18–20 years to 69 years, to primary HPV testing every 5 years for women aged 25–69 years and exit testing for women aged 70–74 years. We aimed to identify the earliest years in which the annual age-standardised incidence of cervical cancer in Australia (which is currently seven cases per 100,000 women) could decrease below two annual thresholds that could be considered to be potential elimination thresholds: a rare cancer threshold (six new cases per 100,000 women) or a lower threshold (four new cases per 100,000 women), since Australia is likely to be one of the first countries to reach these benchmarks. The National Foundation for Infectious Diseases (NFID) will present a webinar titled Protecting Adults with Chronic Health Conditions against Influenza on October 11 at 12:00 p.m. (ET). NFID medical director William Schaffner, MD, will moderate the session that will include presentations by Margot Savoy, MD, MPH, Temple University School of Medicine, representing the American Academy of Family Physicians, and Allen J. Taylor, MD, MedStar Washington Hospital Center, representing the American College of Cardiology. The National AHEC Organization will present a webinar titled "Since You Asked": Persuading Parents that HPV Vaccine is Safe and Effective in Practice" on November 1 at 3:00 p.m. (ET). The webinar presenters will be two pediatricians: Kristin Oliver, MD, MHS, Icahn School of Medicine, Mount Sinai, and Sharon G. Humiston, MD, MPH, FAAP, University of Missouri-Kansas City. The presenters will discuss practical approaches and highlight tools for persuading parents that HPV vaccine is safe and effective in a busy clinical setting. Access information about the webinar and presenters. For additional information, email info@ntc.nationalahec.org. The National Foundation of Infectious Disease's (NFID) Fall 2018 Clinical Vaccinology Course will be held November 3–4 in Bethesda, MD. This 2-day course focuses on new developments and issues related to the use of vaccines. Expert faculty provide the latest information on vaccines, including updated recommendations for vaccinations across the lifespan, and innovative and practical strategies for ensuring timely and appropriate immunization. Continuing education credit is available for attendees. NFID is inviting abstract submissions of original research and clinical practices for poster presentation. The deadline for submissions is October 18.